SO MUCH YARN, SO LITTLE TIME! : Tubular bind off with kitchener stitch. Tubular bind off with kitchener stitch. Ok, here it goes. Go get some needles and a bit of yarn and have at it. 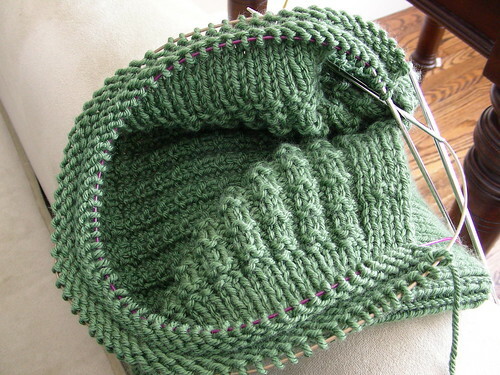 Work and inch of 1x1 ribbing (K1, P1) so you can bind it off. Ok, now. We need to set up the bind off by knitting 4 rows, so ensure you have enough yarn left. Sarting with a right side row Knit the first stitch. Now bring your yarn to the front of your work as if to purl. Slip the purl stitch as if to purl. Now move your yarn to the back and knit the next stitch. 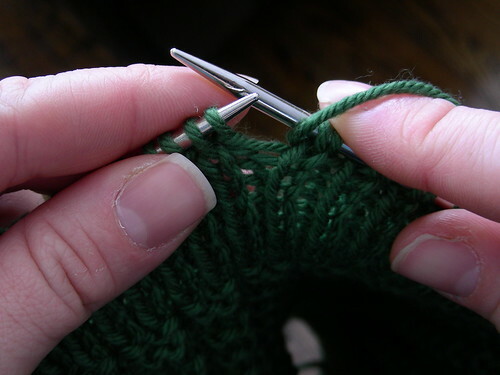 Continue across the row and finish the row by slipping the last purl stitch. Turn your work and it will look like this. You can now repeat these steps for 3 more rows, ending with a ws side row. Ok, that was the set up part...is eveyone ok? 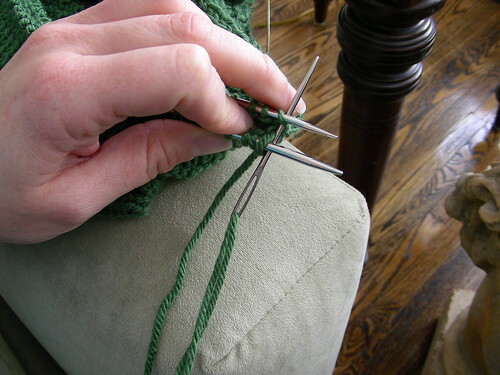 Go grab 2 circular needles smaller than the ones you are working on. These will act as stitch holders basically, so the size does not matter, as long as they are smaller. 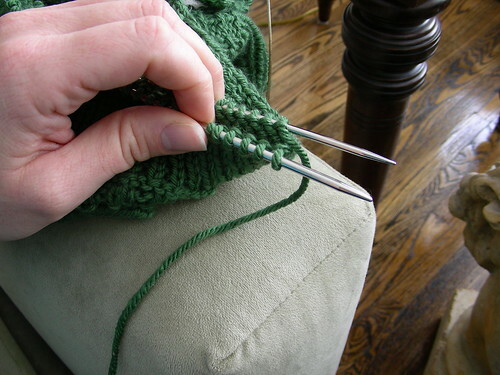 The knitting should be in your left hand and the needles in your right. I use my right index finder to hold the needles slightly apart and grab any stitches if needed. Using the front needle slip the first knit stitch as if to purl and on the back needle slip the first purl stitch as if to purl. Continue slipping as if to purl. All knit stitches go on the front needle and all purl stitches go on the back needle. Once all your stitches are transfered on to the spare needles, it will look like this. You are now ready for kitchener stitch. Take a deep breath and proceed as follows. Set up the kitchener stitch by having the purl stitches at the back, with the working yarn, and the knit stitches at the front. 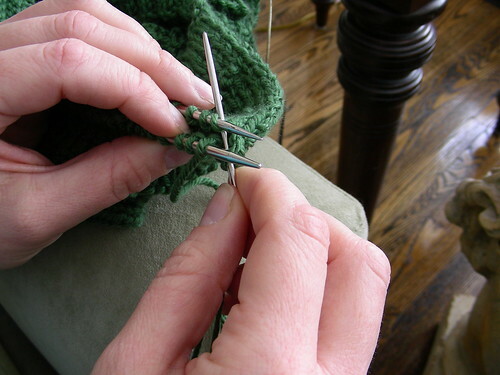 Leaving a fair length for stitching, thread the length of working yarn onto a needle. 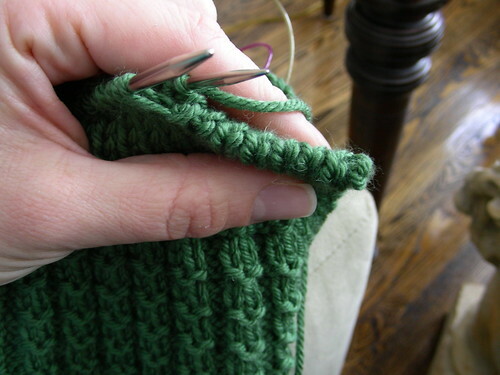 Put the needle in the first knit stitch on the front needle as if to purl and pull the yarn through. Leave the stitch on the knitting needle. 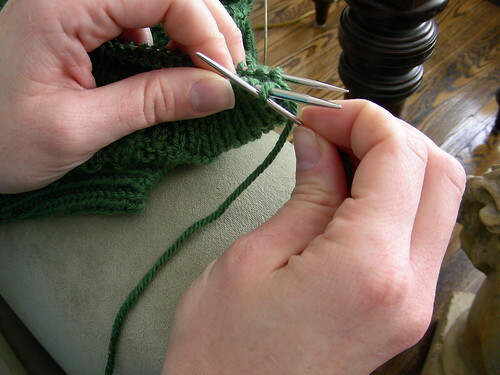 Now, put your needle through the first purl stitch on the back needle as if to knit. 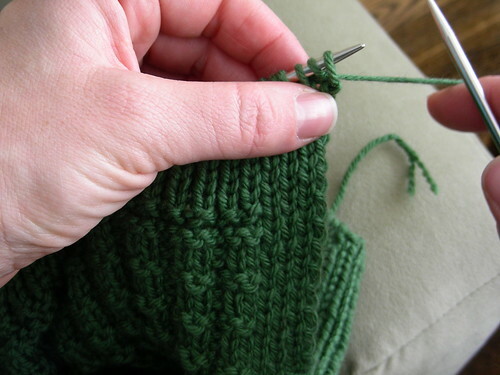 Pull the yarn through and leave the stitch on the knitting needle. Do the following two steps until you have no stitches left. 1. 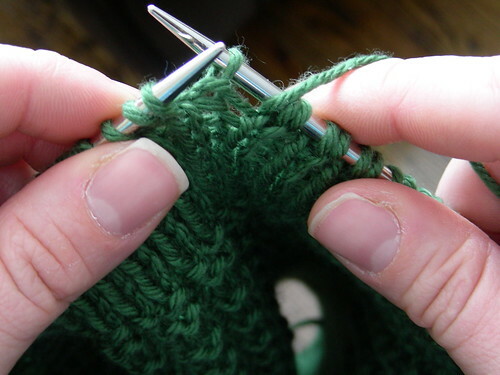 Put the needle through the first knit stitch in the front needle as if to knit dropping if off the knitting needle. 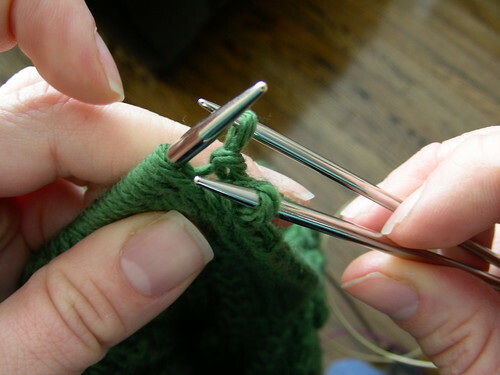 Then put the needle through the second stitch on the same needle as if to purl, leaving it on the needle. Pull the yarn through. 2. 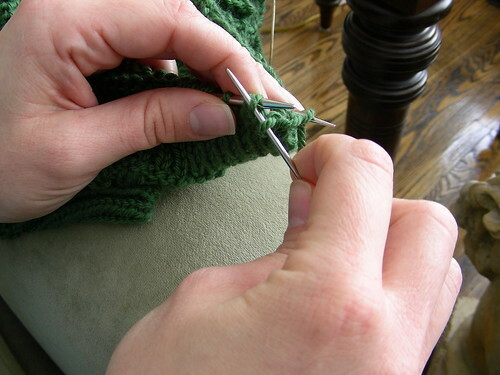 Put the needle through the first purl stitch on the back needle as if to purl dropping it off the knitting needle. 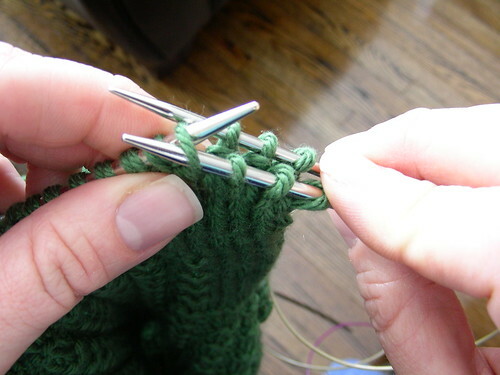 Then put the needle through the second stitch on the same needle as if to knit, leaving it on the needle. Pull the yarn through. *Keep your eye on your sewing tension as you go. 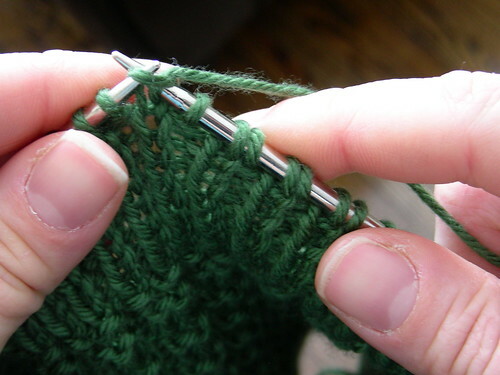 When you get down to the last stitch on the front needle, just put the needle in as if to knit and slip it off. The last stitch on the back needle, put the needle in as if to purl and slip it off. Sew in your end and have a look at your beautiful tubular bind off! Thanks for the tutorial. This was most helpful! Brilliant! Thanks for the lesson. This is awesome! Thank You, Thank You for posting!!! Wow - what an impressive pic-tutorial. I used to finish all my knitting this way about 20 years ago... then stopped. Thanks for reminding me about this fabu method. I'll have to give it a try again. That's gorgeous! I am going to have to do this. 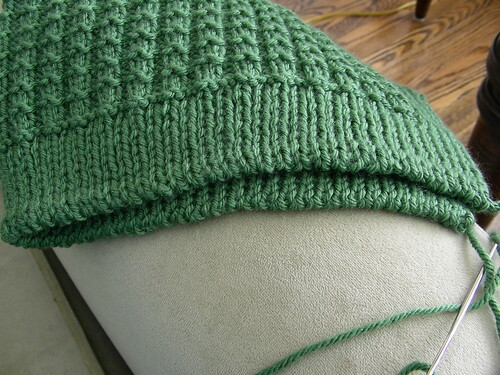 You can get a stretchier bind-off by omitting the knit-and-slip setup rows. I use this on the tops of my socks. This version is good for sock cuffs and other things that have negative ease, since it really wants to be the size of slightly stretched ribbing rather than the size of totally pulled-in ribbing. And it's probably not as good a match with the tubular cast-on as what you have. But still useful, in some circumstances. Great tutorial. Now I know this is a silly question but what kind of projects can I use this on? I'm going to bookmark this tutorial. Thanks so much for sharing! Great pics and explanation. Wow - great tutorial. I am going to start using this whenever possible. You do wonderful work and are so kind to share ! Thank you, it will be very helpful! Such clear instructions! Thank you so much for this tutorial, this bind off is gorgeous. This is wonderful! I was reading and knitting with Montse Stanley trying to follow along with the slight description in the book (and I think there's even a typo as Stanley has you repeating the wrong row for set up), and I got a very funny looking cast off. So I thought I'd try one more time online and found your tutorial. Bravo--your instructions and pictures are so clear, and it worked like a charm on my swatch! Thanks for a great post! Will be referring back to this for sure.